EXCLUSIVE / The European recovery remains on track, despite turbulence in China, according to EU Commissioner Pierre Moscovici. But he also warned against complacency. 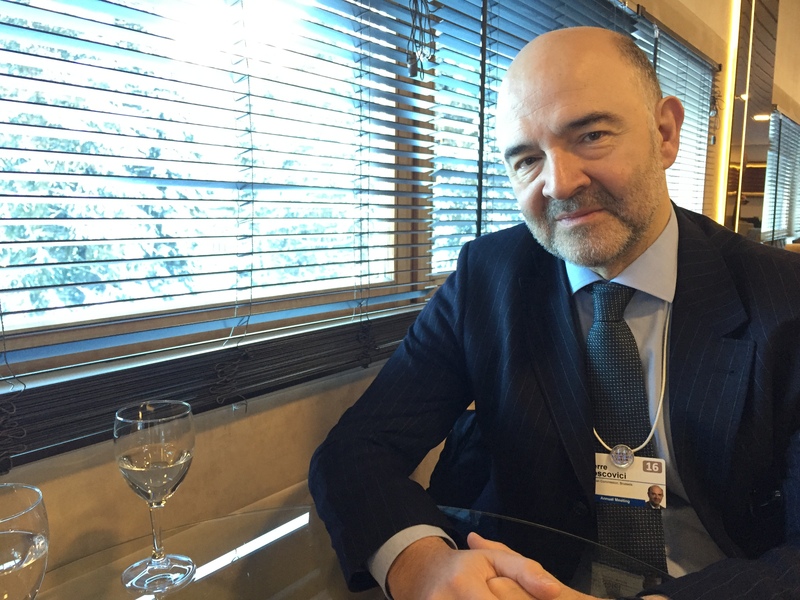 In an exclusive interview with EURACTIV at the World Economic Forum in Davos, Moscovici urged Greece to be more ambitious with its pension reform. Pierre Moscovici is EU Commissioner for Economic and Financial Affairs, Taxation and Customs. You met with Prime Minister Alexis Tsipras at the World Economic Forum. The pension reform is the big issue on the table. Are you asking only for some fine-tuning of the reform, or are your objections more substantial? I had a 15 minute-long meeting with Tsipras, which is a long meeting here in Davos. We are trying to work on what could be a global approach. We did not enter into specifics. It is not up to me to negotiate the precise parameters of a pension reform at this stage. The Greek authorities and the European partners want to go on in building a success story in Greece, which means a full implementation of the programme, and strong reforms leading to a rapid conclusion of the first review, so that we can go on with the programme, and start the debate on alleviating the debt service under good conditions. All with the presence of the IMF, which I think is a necessity for the Europeans. The IMF is part of the security of the programme, and a guarantee for its future. I discussed with Tsirpas how this success story could go on. Of course, I insisted on an approach step by step. This means succeeding in the first step, which is what is necessary to conclude the first review and mostly the pension reform, and the implementation of the privatisation fund. The IMF wants more cuts. Does the Commission share the Fund’s position? We did not have a technical discussion. We are in Davos, where people can meet in a more relaxed way and discuss global issues, but not specifics. I hope that the conditions for the return of our mission’s chiefs are met very soon. Prime Minister Tsipras and I believe that it is preferable if we can move as fast as possible. Together, we want a pension reform which is ambitious enough to conclude rapidly the first review, so everyone is reassured that the programme is on track. Of course, I insisted on the fact that the first draft of the pension reform was appreciated, because it was more comprehensive and ambitious than what we saw before. But still there are some issues to adjust, some efforts to be made. Given that Europe faces numerous challenges, and it would be difficult to handle another crisis like in the past year, would there be some leeway from the creditors to avoid another Greek tragedy? We don’t have to alleviate our demands. We have a roadmap, the memorandum of understanding which is based on the July agreement. We have to fulfill it. But obviously, the climate and working conditions, the relationship between the institutions, the member states and the Greek government have changed positively since July. To sum up what I said to Alexis Tsipras: we must keep the momentum. Let’s not enter in the atmosphere of drama or any kind of ‘Grexit’ scenario. We were too close to Grexit in the summer. We avoided that. We don’t want to re-enter into that. On the contrary, let’s keep the momentum by advancing with the programme. Therefore, we need an ambitious pension reform. We are not there yet, but I am confident that with goodwill and strong technical manage we can get there. Is the pessimism around this year’s Davos forum justified? I will give the EU forecast in two weeks from now. Other institutions are more pessimistic when it comes to global growth, especially because of what is going on in the emerging countries. We all have to care about what is going on in China. The markets are nervous. But if I look at the European economy, I don’t see any special reason to change our message, which is that the recovery is on track. The recovery has a solid basis due to an appropriate monetary policy; structural reforms, that of course have to be pursued; fiscal consolidation, which is impressive, even if some countries have to maintain the necessary structural adjustments; and also because of the ‘Juncker plan’, which must be accelerated, but can be a success. Of course there are downside risks, but we feel we are less vulnerable than other parts of the world to a possible slowdown of the Chinese economy. For the time being, the climate here in Davos is not optimistic, but we are not getting back to the financial and the economic crisis of 2007/2008. Everyone is looking at China, but I met a lot of actors, especially from the private sector, who are quite confident that the transition period in China would not damage the global economy, and the soft landing scenario of the Chinese economy is the most credible one. Regarding Spain, the Commission’s message is that a stable government is needed to continue with reforms. However, the outcome of the last election was a fragmented scenario, with some parties in favour of unraveling the reforms. Is the recovery at risk? It is clear that the political landscape is more fragmented than ever. We respect the vote of the Spanish people. In this situation, it is difficult to move on with the structural reforms, which have been asked and the fiscal adjustment that may have to happen. We will be capable of dealing with these important questions when there is a government which is stable. It is up to the Spanish people to choose the formula they want. Once a solution is found, we will have to go back to reality and the European rules that we all have to follow. In my view, the Commission’s opinion on the Spanish budget is still valid. In any scenario, it looks difficult that the changes requested for the budget will come in time for the Commission verdict in Spring. Is stepping up the infringement procedure the next step? Im not an ‘if’ person. It is up to the Spanish political forces to find a solution. But there are things that have to be done in Spain to be in full compliance with the rules, and will be on the table of any future government, whoever runs it. We will have to discuss that once we have the definitive data. Does it mean that you will improve the Spanish growth forecast? We must be also conscious that the need for structural reforms and adjustments won’t disappear with a political solution in Spain. We will integrate the upcoming information. First, the economic forecast and, after, the definitive fiscal data from Spain. The Spanish economy is in full recovery with an impressive growth and we want that to go on. The Commission’s intention is not to break the conditions of this recovery. But we know how big is the unemployment rate in Spain. In addition, when we look at the fiscal situation, both the nominal and the structural deficit, it seems that some adjustments must be made if you want to fulfill the rule. We will discuss that after a political situation is found. But of course it is better to have a stable government to deal with that.